2017 is just 3 days old, hope you scatter joy and happiness wherever you go all 362 days of the upcoming year. New Year gives us the perfect chance to start something new and fresh and that’s why we are here with you to give you something informative and very very important. Thousands of Job hunters will be looking for new Jobs across United Arab Emirates especially in Dubai & Abu Dhabi because of its rich hunting ground for job seekers. This is really sad and disturbing that the Fraudulent Companies or Recruitment firms in United Arab Emirates are playing with people’s Life especially with those who are on Visit visas or those who are looking to change their sponsor’s because of Low salary, Duty Timings or other related issues. We have written the most causes and the way to avoid being scammed in below Guide, Please read out and do share with your love ones for awareness. 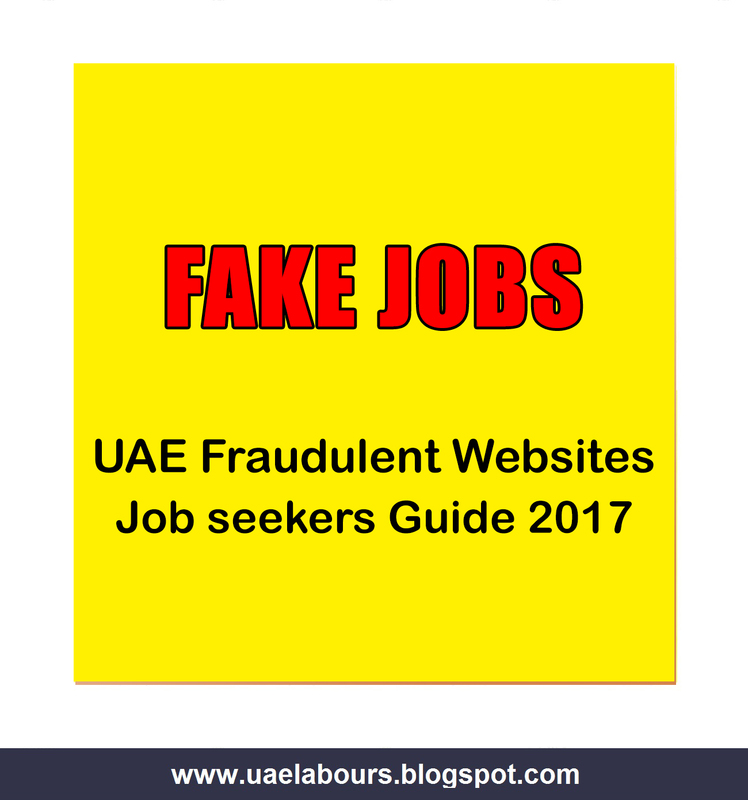 Fraudulent websites are using online ads to advertise their fake jobs on Internet. Once you have landed on their websites they will somehow make you ready for registration or sign up process. After sign up or account registration process, scammers will start to collect your data by creating a profile, at the completion of your personal profile they will try their best to force you to subscribe or upgrade for their premium or paid service. 1: Premium or Paid candidate moves to the top of Employer list any time user applied for Job. 2: You will get most experienced and attractive profile. 3: You will be given best position on all listings. 4: Your job applications will be always on top of the list. 5: You will get high salary job with all benefits. Above are the most common reasons why job seekers are paying those fake website owners. Please note that fraudulent websites will also show you some fake candidate’s or companies testimonials by adding false images and text. Search Google for more regarding "Fake Testimonials"
Check out an example of Fake Jobs Testimonial. 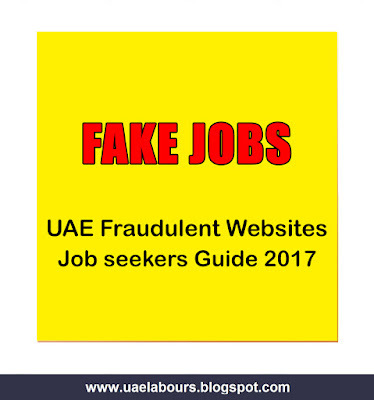 Such type of website are controlling or operating outside United Arab Emirates, so the risk of getting arrest or other legal action from local authorities is very low and the opportunity to target unsuspecting and innocent job seeker is very high. So be Careful. Companies who are having recruitment staff are using advance technology gadgets and desktop ads to advertise their hiring, it is noted that mostly Fake Jobs are advertising online mentioning high salaries and benefits for user’s attraction. Candidates were given contact numbers only, once you have called those numbers you will be address for Interview on urgent basis. After visiting to the given address, you’ll see dozens of job seekers waiting for their turns, the waiting time makes you believe that the setup is 100% genuine. You have called by Recruiters they will ask you some questions including your current visa status, employment history, expected salary and few more. You will be given maximum 1 week time to make yourself ready for face to face interview with officials. You will be excited and sometimes more excited that you have done everything and get a great job but do not know that somebody is paling with you. “Congratulations Mr/Ms. Fool” You are hired, our HR Department had a close look at your resume and would like to tell you that you are suitable for this post. The problem begin when recruitment agent the so called HR ask you to pay Hiring Fees or Registration Fees in Advance that worth 200 to 300 AED. Due to long wait, 2 Interviews, desperation, urgency and other financial or family issues candidate loosed his/her strength and ready to take chance and make the payment with positive thinking that he/she secured a job. But let us tell all of our readers that you have been fooled by those fake Recruiters. You will be never ever call for contract sign or visa process, so please be careful, don’t waste your time and money, as we have noticed that educated candidates from Pakistan, India and Philippines also complaining about the drama played with them, so When a well-qualified candidate fell into that drama, how about job seekers with less knowledge and education? How Fake Recruiters & Companies attracting candidates? 1: Advertising High Salary Jobs. 2: No Experience is required. 3: All benefits will be provided. 4: Direct Hiring from Home Country. 5: Urgent & Immediate Hiring. How to Avoid Being Scammed and Cheated? 1: Always apply through Company official website. 2: Do the Authentication of Website. 3: Do not Pay for Jobs, this is 100% scam. 4: If you already visited recruiter, ask the web name and details of Company you will work for. 5: Do not provide your Bank Details to anyone. 6: Do not pay Processing Fee, Registration Fee or Hiring/Service charges. 7: Do some research about the company you are going for interview. 8: Check out LinkedIn.com that contain data of most companies around the globe. 9: Do not reply to the spam mails, it mostly cheats. 10: Always check “About us” Page on site you are applying, if this page is not present, do not deal with them. We are ending our Guide with few words, their are hundreds and thousands of those who have lost their jobs or looking for new jobs, and or visiting those fraudulent companies on visit or Tourist visa and getting cheated every day. Companies and Recruiters who are involved in scams and other illegal activities should be put behind bars. Please register a complaint to Police on any site that conducting scam, hope authorities will take legal actions. Please be on high alert when approaching such companies, and one more time please do not pay anyone for Jobs. Please comment incidents if you have come across any for awareness. Please share this Important and very informative Guide with your friends, colleagues and family members on social sites from below icons, thousands of expats are looking for authentic information here in UAE. Your 1 Share will be appreciated and it is enough to help someone. All content of this Guide is protected by copyright, no one is allowed to copy our content. Jobs and Career Guide-Career guides & job Search resources by careerchamber.com. options career guides and job search resources to guide you thru your career.Apart from the standard (one-job-for-life) vacancies that were in style among the previous generation, the task market offers opportunities in new industries and disciplines.We will attempt to embrace as numerous topics to hide the spectrum of careers and industries that may fit your surface & and wage expectations. FOR THOSE WHO NEED XMAS LOANS. When will RRB ASM Recruitment 2018 Notification is released for latest vacancy in Railway Department. How to get registered in RRB ASM Recruitment 2018 application for latest upcoming vacancy in Railway Department by official website. The details of the RRB ALP (Asst. Loco Pilot) Recruitment Notification and the online application will be uploaded to all the 21 RRB Official websites. The online application was started on 3rd Feb 2018 which has now been changed to 28th Feb 2018 and the Last date of filling the RRB ALP online Application form is 31st March 2018 (23:59 hrs). We the Arik Fly Loans Service we Provides both long and short term loan financing. We offer secure and confidential loans at a very low interest rate of 3% per year, Personal loans, Debt Consolidation Loan, Venture Capital, Business Loan, Corporate Loans, Educational Loan, Home Loan and Loans for any reason! We are the trusted alternative to bank financing, and our application process is simple and straight forward. Our loan ranges from $10,000.00 to $600,000,000.00 . (Ten Thousand Us Dollars To Six Hundred Million Us Dollars ). Additional Info: We're fast becoming the private, discreet, and service oriented lending choice for general loans. We're the company to turn to when traditional lending sources fail. If you are interested do not hesitate to contact us by Email: (arikfly.loans@gmail.com) for more information.